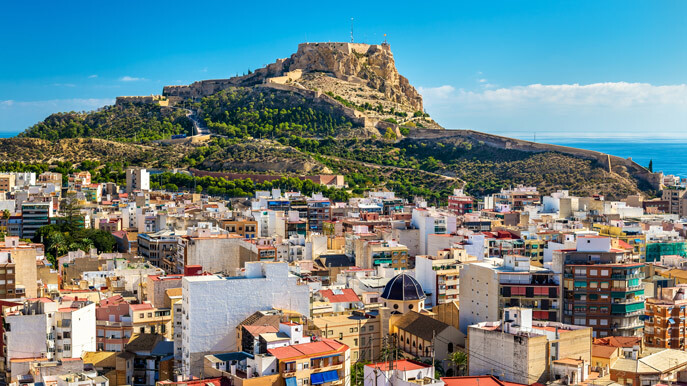 Alicante has more to it than meets the eye! Great culture, sandy beaches and lots of things to see and do, not the mention the entertainment! Top tip for great views over the city head to Castillo de Santa Barbara. The popular resort of Benidorm is a short transfer away around 30 minutes. Gateway to the Costa Blanca and party capital of the Valencia region, Alicante is defined by its delectable white-sand beaches. Most visitors consequently choose to base themselves within an easy stroll of the sea, and the city's best hotels jostle for space along this coastal strip. Five-star Hospes Amerigo (Calle de Rafael Altamira 7) combines a central location and easy access to the beach with a rooftop spa that has panoramic views over Alicante Cathedral and Santa Barbara Castle. A little further from the town centre but even closer to the sea, Melia Alicante (Plaza del Puerto 3) overlooks the harbour and attracts visiting yachties from all over Europe. Hotel Bahia (Calle de Gravina 16) is more basic, but still has that all-important coastal location. Most of Alicante's mainstream shops are clustered around the Rambla de Mendez Nunez and the Maisonnave area, but if you?re looking for a true taste of local life then head to the Merdaco Central on the Avenida de Alfonso el Sabio. This is where local traders hawk their fresh produce, and it backs onto a pretty little square full of flower stalls. Local street markets Campoamor, Carolinas and Benalua y Babel take place on Thursdays and Saturdays, while the Town Hall Square hosts a Sunday morning flea market of epic proportions. Visitors with fashionista leanings should pop into bargain shoe shop Botticelli (Avenida Maisonnave 9) or indulge in a spot of window shopping at Plaza Mar 2 Shopping Centre (Avenida de Denia 1). A combination of cosy tavernas and beachside cafes dominate the food scene in Alicante, with tapas the main cuisine of choice. La Taberna del Gourmet (Calle San Fernando 10) serves up some of the best tapas in the city, but you'll find a more contemporary menu at El Portal (Calle de Bilbao 2). Alicante?s coastal location makes fresh seafood an abundant commodity - classy Restaurante Darsena (Muelle de Levante 6) takes full advantage of this availability with its incredible paella and fish dish selection. For a tasty budget lunch, head to Ibericos (Calle Gerona 5), which does fabulous Iberian-style sandwiches as well as a good tapas selection. Kicking off with the Don Carnal and Dona Cuaresma plays, this action-packed festival lasts for a full three weeks. The main event is on 2 February, when a colourful parade winds through Alicante's main thoroughfares. On the second Thursday after Easter, around 200,000 pilgrims from all over the world gather together in Alicante to worship at the Monastery of the Santa Faz. Traditionally, participants wear orchard-worker blousons and carry a pilgrim's cane as they journey up to the monastery. Fogueres de Sant Joan June Dating back for hundreds of years, this popular festival celebrates both St John and the beginning of summer. The burning of several satirical papier mache statues is followed by bonfires and fireworks at St Barbara Castle. The international jazz elite jets into Alicante for this long-running music festival. Throughout the months of July and August, a series of planned concerts and events - not to mention plenty of free street performances - take place throughout the city. Virgen del Socorro September A parade in honour of the patron saint of sailors and fishermen processes through the Raval neighbourhood every year at the beginning of September. Fringe events include fireworks, music and dancing.